Last week I picked up this colorful tasseled bracelet set from Waiting on Martha and have been wearing them ever since! Even though the weather is still a bit chilly in Dallas, I can at least dress up my wrists for spring with these adorable bracelets. I’ve got tassels on the brain this season and keep finding excuses to buy more pieces with them. From a bright pair of Oscar de la Renta earrings, to a tassel-adorned summer scarf, there are so many gorgeous pieces out there with this super cute detail. For example, Rosantica has some particularly amazing tasseled items this spring – I’ve got my eye on this multi-color trio-tassel necklace. Another winner is this double strand necklace – the colors are more subdued and could be worn year-round. How cute will they be paired with just a white tee and cutoffs or jeans this summer? They do all the talking for your outfit. Chic. Finally, let’s not forget these Tory Burch wedges. Get in my closet! PS – while this pom-pom pillow didn’t make it to the collage, I’m completely enthralled with it. Isn’t it adorable?! I’m in love with tassels! I could literally have them on everything I wear during this time of the year! Great round-up! I love tassels, I need to get a stack of these bracelets, so so cute. I am all about this trend! Just got a pair of tasseled flat sandals and I picked up some tasseled earrings too – so fun! I love the tassel trend! Last year I purchased a few Sea Elise necklaces and I’m so happy that I did! DYING over those earrings… Great post and recommendations (as always)! Love! Such a fun detail. And those Alejandra G sandals, whoa, amazing! I’m loving tassels, too! These are such cute picks! LOVE the necklace! Amazing picks, ADORE those tassel heel sandals! That scarf is a must have!! Perfect for the beach or with a white tee and jeans. Great picks! 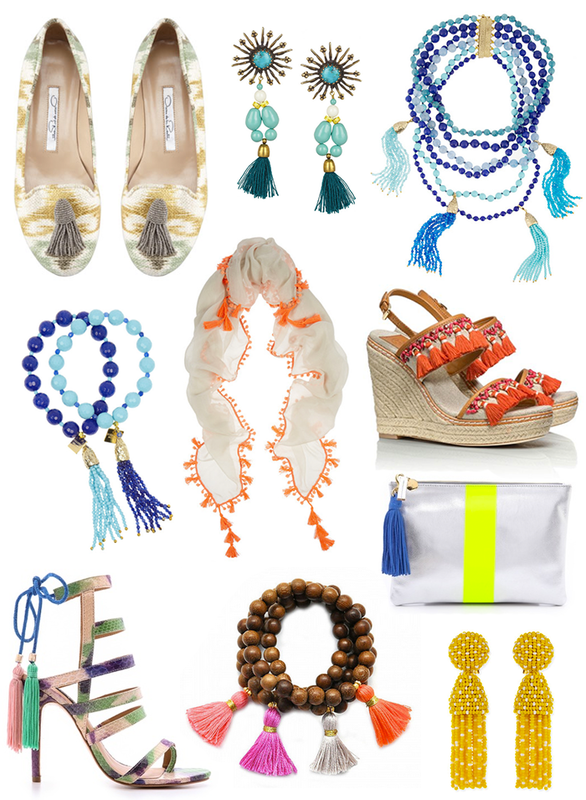 Love these tassel items for Spring and Summer! I love this trend! Those tassel bracelets are my fave! I love all of these – especially the ROSANTICA Himalayan Gold-Dipped necklace. That over a white dress, gorgeous! I refuse to let myself click on the links because I want them allll hahaha! I just purchased some gold & gray tassel bracelets yesterday and I cant wait for them to arrive in the mail. I am loving all the tassels that are popping up everywhere lately! This fall I purchased a tan scarf with bright pink tassels that I just love, I would wear it almost every day if I could! I adore how these tassels have been added into everything from shoes, to earrings to clutches. I need to find an item with a tassel. Love the Alejandr heels and scarf. It is hard to pick my favorite out of this group, that scarf is amazing! This is on point love it!!! I picked up a couple of tassel bracelets the other day as well! !